Tomb of Absalom (Hebrew: יד אבשלום‎, Transl. Yad Avshalom; literally Absalom's Shrine), also called Absalom's Pillar, is an ancient monumental rock-cut tomb with a conical roof located in the Kidron Valley in Jerusalem. Although traditionally ascribed to Absalom, the rebellious son of King David of Israel (circa 1000 BCE), recent scholarship has dated it to the 1st century CE. 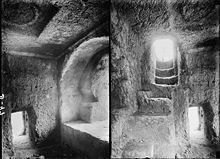 Absalom's Pillar, a tomb in itself, also served as a funeral monument to the burial cave system located behind it, the "Cave of Jehoshaphat". The freestanding monument contains a burial chamber with three burial sites. The chamber is carved out of the solid lower section of the monument, but can only be accessed from the upper section via a built entrance and a staircase. Absalom's Pillar is approximately 20 metres (66 ft) in height. The monument proper stands on a square base and consists of two distinct parts. The lower section is a monolith, hewn out of the rocky slope of the Mount of Olives, while the upper part, rising higher than the original bedrock, is built of neatly cut ashlars. The lower half is thus a solid, almost perfectly cubical monolithic block, about 6 m (20 ft) square by 6.4 m (21 ft) high, surrounded on three sides by passageways which separate it from the vertically-cut rock of the Mount of Olives. It is decorated from the outside on each side by pairs of Ionic half-columns, flanked in the corners by quarter-columns and pillars (a so-called distyle in antis arrangement). The four square facades are crowned by a Doric frieze of triglyphs and metopes and an Egyptian cornice. The upper, ashlar-built part of the monument consists of three differently-shaped segments: a square base set on top of the Egyptian cornice of the lower part, followed by a round drum crowned by a rope-shaped decoration, which sustains a conical roof with concave sides (the easily recognisable "hat"), topped by a half-closed lotus flower. The upper part of the monument corresponds to the outline of a classical tholos and is not unlike contemporary Nabatean structures from Petra. On the inside, the upper part of the monument is mostly hollow, with a small arched entrance on the south side set above the seam area (where the masonry part starts). Inside this entrance a short staircase leads down to a burial chamber carved out of the solid, lower section. The chamber is 2.4 metres (7 ft 10 in) square, with arcosolium graves on two sides and a small burial niche. The tomb was found empty when first researched by archaeologists. An analysis of the architectural styles used indicates that the monument's construction and its first stage of use happened during the 1st century CE. The irregular-shaped holes made into the monument are of later date, probably from the Byzantine period. Even the original entrance has been widened in such rather defacing manner. See also under Inscriptions below. A "monument of Absalom" did exist in the days of Josephus, and was referred to in his Antiquities. The 19th-century English translation by Havercamp states that the "monument of Absalom" stood at a distance of "two furlongs" from Jerusalem. The attribution of this particular monument to Absalom was quite persistent, although the Book of Samuel reports that Absalom's body was covered over with stones in a pit in the Wood of Ephraim (2 Samuel 18:17). For centuries, it was the custom among passersby—Jews, Christians and Muslims—to throw stones at the monument. Residents of Jerusalem would bring their unruly children to the site to teach them what became of a rebellious son. The tomb's exterior design features a Doric frieze and Ionic columns, both being styles originating in ancient Greece and introduced into Judah during the Seleucid Empire, centuries after the death of Absalom. At the start of the 20th century, the monument was considered most likely to be that of Alexander Jannaeus, the Hasmonean king of Judea from 103 to 76 BCE. However, archaeologists have now dated the tomb to the 1st century AD. In a 2013 conference, Professor Gabriel Barkay suggested that it could be the tomb of Herod Agrippa, the grandson of Herod the Great, based in part on the similarity to Herod's newly discovered tomb at Herodium. Archeologically, the so-called "Tomb of Absalom" is not only a burial structure in its own right, with its upper part serving as a nefesh or funeral monument for the tomb in its lower part, but it was probably also meant as a nefesh for the adjacent burial cave system known as the Cave or Tomb of Jehoshaphat, with which it forms one entity, built at the same time and following a single plan. During the times of the Second Temple, many wealthy citizens of Jerusalem would have monuments built adjacent to their family burial caves. These monuments were built according to the architectural fashions of the time, many times with a pyramid on top, or in this case, a cone. Jewish sages of that era opposed the building of such monuments by saying: "You do not make Nefashot for the righteous; their words are their commiseration." In 2003, a 4th-century inscription on one of the walls of the monument was deciphered. It reads, This is the tomb of Zachariah, the martyr, the holy priest, the father of John. This suggests that it was the burial place of the Temple priest Zechariah, father of John the Baptist, who lived 400 or so years earlier than the inscription date. This inscription is part of a secondary usage of this monument during the Byzantine period, where Christian monks commemorated stories from the Christian Bible inside old Jewish tombs in the Kidron Valley. 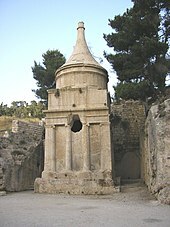 The Zechariah inscription has led to confusion with the nearby "Tomb of Zechariah", which commemorates a much earlier figure, the prophet Zechariah ben Jehoiada, according to local folklore; however, it is not a tomb and might also be a monument for the nearby burial cave of the priestly family of Hezir. Another inscription discovered in 2003 says the monument is the tomb of "Simeon who was a very just man and a very devoted old (person) and waiting for the consolation of the people". The passage is identical to Luke 2:25 as it appears in the Codex Sinaiticus, a 4th-century manuscript of the Bible. According to a local legend, Napoleon fired a mortar at the tomb, and removed the shape of a hand that topped the conical roof. However, Napoleon never reached Jerusalem during his campaign in the Holy Land. Actually, the top of the monument is not at all broken, but rather is carved to resemble a llotus flower. A Muslim tradition connects the tomb to the Pharaohs, hence the Arabic name "Pharaoh's Hat". ^ "Archaeological Supplement: Absalom's Pillar", in Thompson Chain-Reference Bible, 1964 edition, p. 311. Retrieved on 2009-11-17. ^ a b Kloner, Amos; Zissu, Boaz (2003). The Necropolis Of Jerusalem in the Second Temple Period. pp. 141–143. ^ a b Hachlili, Rachel. Jewish Funerary Customs, Practices and Rites in the Second Temple Period. Boston: Brill, Leiden, 2005. Pages 30-34. ^ a b Zev Vilnay (1970). "Pillar of Absalom". The Guide to Israel. Jerusalem: Hamakor Press. pp. 157–158. ^ a b Amiram Barkat (22 July 2003). "Jewish Yad Avshalom revealed as a Christian shrine from Byzantine era". Haaretz. Retrieved 27 September 2018. ^ "Gospel verse found on an ancient shrine". NBC News. Associated Press. November 20, 2003. Retrieved August 10, 2014. Wikimedia Commons has media related to Yad Avshalom. Virtual Tour of Jerusalem. Offers 360-degree view from front of Absalom's Pillar. This page was last edited on 20 March 2019, at 00:12 (UTC).